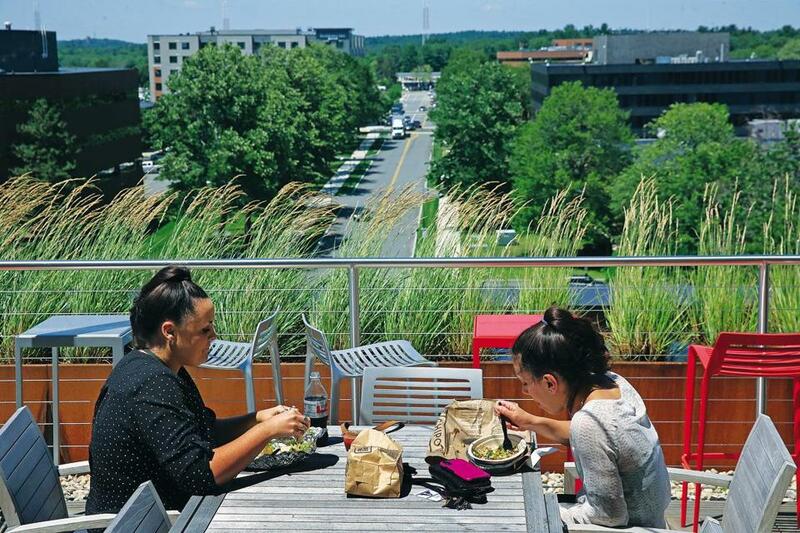 A rooftop deck has a dining area, grill, and outdoor television with a view of the main road below at the office park. Today, the property at the edge of Route 128 has bike-rental stations, hip eateries that stay open after the sun goes down, and an “OMMM Space” for yoga and meditation. Oh, and they call it “the District” now. The place used to be “your typical old suburban grandfather’s office park,” said Leah Harsfield, a vice president at National Development, which bought the site in 2013. Now, she said, “it’s more like a college campus,” and it’s designed to help lure a 21st-century workforce that has been spurning the suburbs for the city. 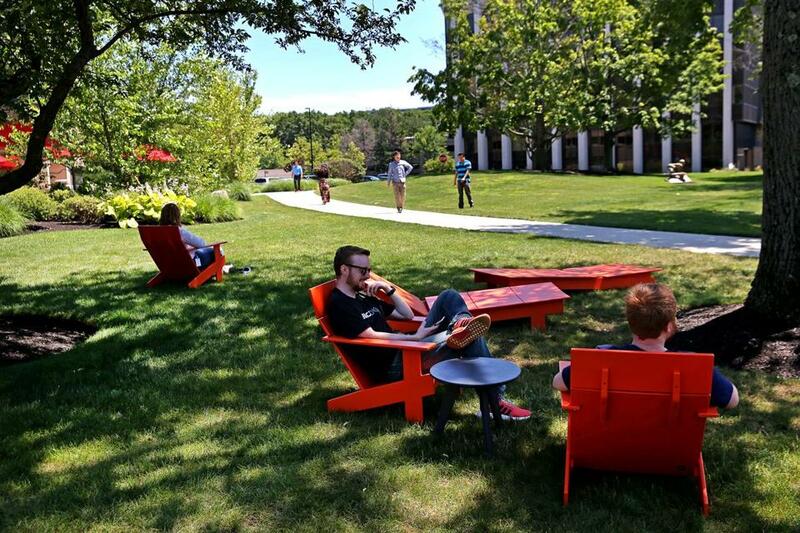 A park-like area with lounge chairs under the shade of trees in Burlington. Like many other employers and developers along 128, National Development has recognized that free parking, easy highway access, and affordable real estate aren’t enough anymore. Now, they want to compete on lifestyle, too. So builders are endeavoring to retrofit sterile office parks with elements of urban life. Owners are adding shops, restaurants, and stylish coffee bars intended to bring their properties out of the floppy-disk era. Many are trying to create housing within walking distance. And to accommodate techies who insist on living in the city, employers are footing the bill to transport them to work, chartering shuttles from transit hubs and even paying for Uber rides. But in the region’s latest tech boom, the action has been near downtown, where companies are paying a premium for space near the transit hubs and cultural attractions they believe are key to attracting top talent in a competitive market. The data provider PitchBook says 72 percent of the venture capital invested in Massachusetts this year has gone to companies headquartered in Boston or Cambridge, an indication of where innovation is happening. Fifteen years ago, Boston and Cambridge firms took in just 12 percent of the venture funding in the state. That doesn’t mean 128 has become a ghost town. The corridor cuts through well-off communities, and large, established employers still jockey for space along the highway. And many firms with deep roots in the area have remained, such as Raytheon and Analog Devices. A recent WinterWyman analysis found that 63 percent of the region’s software job openings last year were in Boston or Cambridge, a figure that Hicks said is emblematic of a shift away from the suburbs in recent years. When Alex Hyman, 29, of East Boston, was looking for a job in tech business development recently, she didn’t even consider the suburbs. She took a job at the travel startup Lola in Fort Point, which gives her an enviable commute: Hyman takes a $5 water taxi across Boston Harbor each day. Boosters along the 128 corridor hope that by adding attractions, they’ll be able to make a stronger case — especially to companies that have a lot of employees who live outside of downtown and don’t mind driving. Some even argue that with commercial real estate values continuing to rise in the city, the suburbs can put themselves in position to reverse the flow. Average office space rents downtown are close to $60 per square foot, according to research by the real estate firm NAI Hunneman. In the western suburbs along 128, which includes Waltham, Needham, Newton, and several adjoining communities, that price is $37. And there are city dwellers who are willing to make the trip for the right position. On a recent morning, Claire Keum caught a shuttle from Alewife Station in Cambridge to the District, where she works as a software engineer. She said she likes the new coffee shop there, and the complex is not a bad place for a walk. But is it as cool as the city? Route 128 has always been a good place for going to work, taking care of business, and driving away. Its construction in the 1950s opened a new era of suburban development, as the car took center stage. The circumferential highway made it possible to travel quickly to and from Boston’s outskirts, avoiding the city entirely. Soon, the city had lost some of its gravitas as a hub of rail and maritime transport, and the classic downtown skyscraper began to give way to a new form. The business park, set on acres of land, became a fixture of American suburban life. By the 1980s, Route 128 was home to some of the most powerful computing companies and had earned the nickname America’s Technology Highway. It wouldn’t last, though. Over time, the region’s best-known companies were bought out or folded, as many failed to adapt amid the explosion of personal computers. The center of gravity in tech drifted to Silicon Valley — which, though similarly suburban, had a much more open and collaborative culture. AnnaLee Saxenian, a professor at the University of California Berkeley, said the Boston area developed a particularly insular reputation in its early days, with little room — physically or socially — for the exchange of ideas. The area darkened at night, and many complained that startup founders had little access to venture capitalists whose decisions could make or break an idea. The investors were on 128, too, but they were mostly cloistered in a Waltham office park known as “Mount Money, ” isolated geographically by a highway-and-office park landscape and socially by a culture that lacked opportunities for easy mixing. Promising companies found it hard to build connections. She said Boston’s success is what keeps 128 ticking today. Michael S. Dukakis, whose terms as governor coincided with a boom along 128, said he had his doubts at the time. He worried that the car-centric business culture would create a “moving parking lot,” and he sought to steer growth to areas with better transit. “It was obvious that, inevitably, it would wind up with what we’ve got out there,” Dukakis said of the traffic and congestion he sees on 128 and in the surrounding suburbs today. 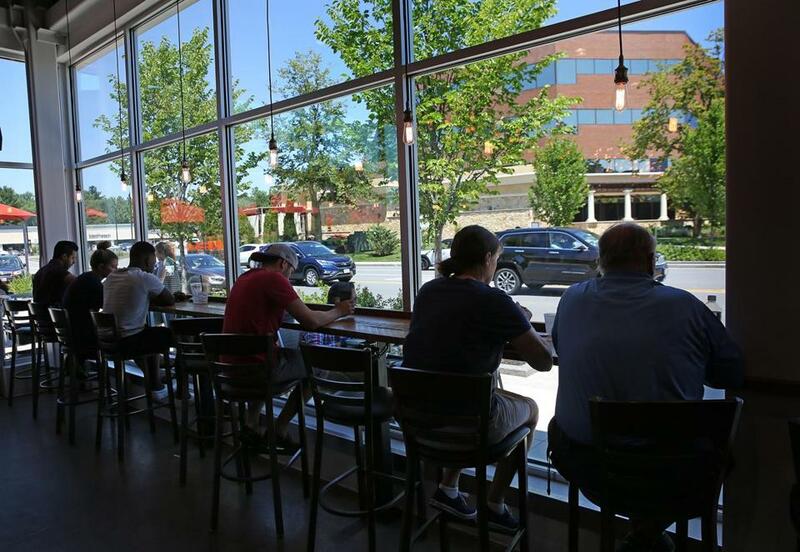 A window view with bar seating at Pressed Cafe by the main road in office park. Route 128 has also endured some demoralizing losses recently as Boston’s urban core has cemented itself as the hot place to be. The software firm PTC announced last year that it would be moving 1,000 employees from Needham to the Seaport, for instance, following companies including Reebok, Autodesk, Converse, Acquia, LogMeIn, and Continuum. “We want to be able to attract and retain the kind of specialized technological expertise . . . that we need to be able to remain competitive for the next 30 years of our company’s existence,” said Eric Snow, senior vice president of marketing at PTC. As PTC departs, civic groups are trying to rebrand the area along the border of Needham and Newton, christening it the N-Squared Innovation District. Chuck Tanowitz, a longtime public relations pro who directs the effort, is trying to find ways to stitch together a coherent business district from disparate office, industrial, and commercial properties. Taken together, he said, it’s an impressive spread. TripAdvisor is there. So is the appliance maker SharkNinja. It even has a little green space: an abbreviated bike route that runs through a wooded area behind the district’s office parks. 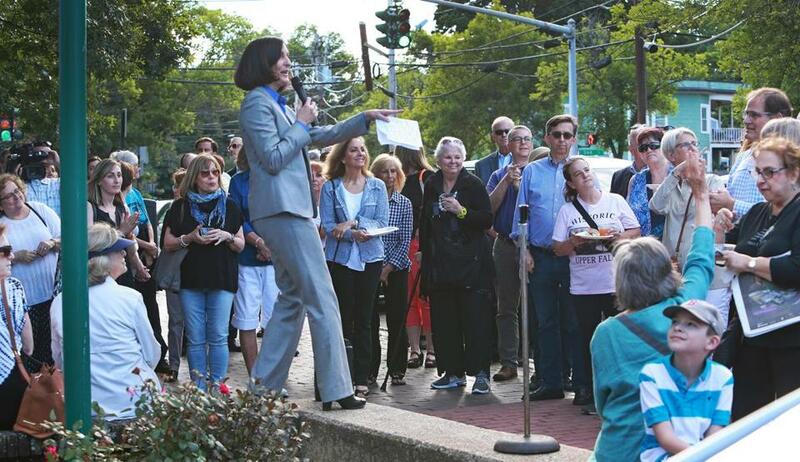 Newton Mayor Ruthanne Fuller speaks at an event called "Beyond Boundaries" held at the Newton Upper Falls Greenway, sponsored by the Newton-Needham Chamber of Commerce in June. John Kelley, chief executive of CoachUp, a digital service to connect young athletes with private coaches, said he had just moved the 10-person startup to Newton from Fort Point. He said he was astonished to learn that his employees mostly lived in the suburbs and that even the twentysomethings were happy to abandon the city commute.